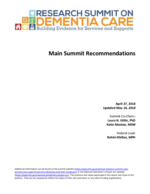 This is the PDF version of the 12 Recommendation Themes from National Research Summit on Care, Services, and Supports for Persons with Dementia and Their Caregivers: Report to the National Advisory Council on Alzheimer's Research, Care, and Service. The Steering Committee and organizers of this Summit solicited input from nationally and internationally recognized experts and researchers, and other public and private sector stakeholders, to develop prioritized recommendations. The recommendations will help guide investments by a number of public and private stakeholders in the field of care, services, and supports, and will provide the structure for future summits. Originally dated April 27, 2018; small changes were made on May 16, 2018.